Near the end of reading week I had the pleasure of taking a quick train ride out to Bath to run around for the evening and take in a show. Specifically, the dramatic and most fabulously done “Casting the Runes” as performed by the duo company Box Tale Soup. To start, the play took place in the Mission Theatre in Bath which is a decent space with very friendly people who are very willing to help you with anything you need. However, my friend and I ended up having to stop and ask for directions once or twice after a slight misdirect from the main box office. The theatre feels almost like it’s on the outskirts of town with a shot of a parking structure out the front of the theatre and surrounded by at least on hole in the wall where—after the show—a rather rowdy group of gentlemen were drinking their night away. I’m not sure if they were staying the night, but my friend and I definitely picked up our pace heading back into the main thoroughfare! The actual show was amazing and definitely a thriller. 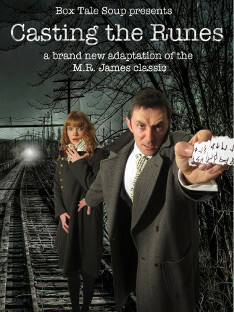 “Casting the Runes” is a one act adaptation of M.R. James’ short story of the same name (with a few alterations and additions including some moments pulled from James’ other works). The story (as told by Box Tale Soup) of Edward Dunning, a scholar (and sceptic) of supernatural phenomenon, whose life is quickly turned upside down (in short) when he receives a strange strip of paper covered with runic lettering. Whether or not you know James’ work, the show put on by Box Tale Soup tells this story in a truly thrilling and (at times) terrifying way that holds you transfixed and unable to look away from the on stage (if only for fear of something sneaking up on you in the dark!). Part of what makes Box Tale Soup so unique as a company and an experience in the brilliant dynamic between the two human actors as well as the truly terrifying and brilliantly thought out use of props and puppets (only one for this production!). In many instances, I know, when a person thinks of puppets they think of children’s toys and shows. Casting the Runes is one major exception. This puppet, playing the role of Mr. Karswell, is a speechless figure draped in a flowing black cloak and hat with a white almost featureless face save for piercing, glowing green eyes which sent a chill down my spine every time it made its presence known on stage. Both its use and design were flawless as were each costume and seen change set to a sung rendition of “The Rime of the Ancient Mariner” by Samuel Taylor Coleridge (and I will never read that poen the same way again!). The tropes set up is a two person team (a lovely married pair of actors) who travel around with all their props packed up into easily portable suitcases which allow them to do pop up shows pretty much anywhere and in any kind of space. All in all, I highly recommend this spooky stage adaptation and will hopefully (if time and money allow!) be seeing this couple again later this year for their award winning adaptation of Jane Austen’s “Northanger Abby” which I’ve been told is a must see. I apologize for the pun, but I have to make this quick but I have to run out the door soon for my final stop of reading week. When packing last week I mentioned boots as a great option believing that there was going to be rain. What I forgot to mention was always pack shoes you would swear your life on will not kill your feet and don’t just research the weather but the area you’ll be covering as well. While I knew my boots would hold up better than most my other shoes walking around as much as I do on a trip, not taking the terrain and slip factor into account, we’ll just say my feet are angry. No matter where you are going, pack a good pair of tennis shoes/workout shoes. there functional and are strangely trending even in the fashionable regions of the world. Also, your feet will thank you! So, it’s finally the day before shipping out which begs the question: are you packed yet? The thing about packing is it’s a lot more than counting the days you’ll be away and pulling pieces out of the closet for each. Instead, it’s a process of planning what little you may need for where you are going, what you’ll be doing and the conditions you’ll be dealing with concerning both. This trip, half of the time I’ll be running around France it’ll be raining, but I still plan to be walking around as much as I can—I can’t really imagine traveling any other way—which means that I’ll need layers. Like I said before, you don’t pack an outfit for each day but plan choice pieces that go together and can be reuse a few times over without making the same outfit every day. Numbers wise, this may mean having more or less the same amount of articles as putting together simple outfits everyday (which are limited and won’t help much when the weather hits), but you get more use as you’ll need to reuse pieces to keep warm! Keeping it small and simple–even my backpack fits inside! For me, this meant packing a few oversized sweaters, long shirts and simple tops which can be layered and mixed with neutral bottoms—specifically, a few pairs of leggings and one pair of skinny jeans. The things that is new for me is planning on wearing leggings out and about (hence the emphasis on log tops with hang to short dress lengths—also a simple cotton skirt to add length to a top if need be—layering!). The leggings I’m bringing are fleece lined, thick and are designed to hold in the heat without becoming transparent but they allow more movement than most of my skinny jeans. This makes them a great choice for running around the city. Also, as they are thinner than jeans, they’ll dry much more quickly than jeans do when dealing with the rainy weather. 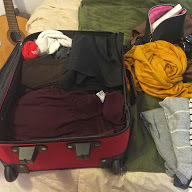 I finish this off with a coat, a scarf, and a comfortable and water resistant pair of boots that cover/protect all skin from the elements and that’s my suitcase! When it comes to France, there are tons of pins on Pintrest that are designed to help you dress like a Parisian. There is a real elegance and simplicity—a lot of neutrals are involved—that I find very nice, especially as a traveler trying to pack things that can be worn together. If it helps you blend in a bit, all the better when it comes to places like Paris, where tourists can be targeted by some unsavory characters (but dealing with this is more about paying attention to where you are and who is around than what you happen to be wearing!). On Tuesday, I went over some of the things you should have checked off your to do list at this point and I mentioned going out and buying things you may need. Basically, this means buying small/compact items—after all, you shouldn’t be taking much more than a duffle or carryon size bag. I talked about this last time I dealt with packing for a trip and my preference for duffels—you don’t put as much in them so you can’t over pack since you have to carry it while rollers you don’t count on weight but with the conditions of sidewalks and cobblestones in old cities you very well may be carrying the bag with you the whole time. Anyway, in light of this weight issue, thinking about compact product can really help. Travel size options are great when it comes to your basic toiletries and 2-in-1 shampoo/conditioner is another quick and easy choice that keeps you from lugging around large, heavy bottles. Also, don’t pull a Rory Gilmore and pack a million books or extra pieces like this. Bring one if your first bit of travel is long and then pick something up while you are traveling. Some hostels have trading libraries you can take from for free and these (or a book from a shop) can serve easily as a souvenir (just write a not on the cover about where and when you got it and any other personal notes and it’s a very simple but meaningful piece of your trip that is unique to your experience!). Whether you are packing clothes, makeup, or activities, packing less stuff that you can get more out of is always the safest bet. Well there we go: the basics. Double check it all before you go to bed (as well as charging up all you electronics from phones to cameras to computers to what have you) along with Tuesday’s list and you should be ready to get to your first check point bright and early with little to no worries. So, happy Valentine’s day/Galentine’s day/Thank God I’m Single day or whatever else you are celebrating this weekend, and happy travels. For the past month or so I’ve been on a mission to find an affordable (but convenient!) place to get my hair cut. Coincidentally, like clockwork, people have been posting over all my social media various posts on haircuts: how you know it’s time to get one, when not to get one, which to get, and on and on. I knew it was time to get cut when 1: I saw split ends and weird breaks appearing, and 2: when my old bangs were finally long enough to join the rest of my hair at a single length (I’ve been waiting so long!). No matter what makes you decide it’s time for a cut, whether a trip or a chop or anything between, knowing what you want is only part of the battle. This time around (my first cut in London), where I went was the real struggle. I said I was on a mission for a month and I’m not exaggerating. While this month let my bangs grow out the tiniest bit more, the real dilemma was finding a place that wouldn’t butcher my hair, wouldn’t take the whole day, and was something I could afford. For context on my usual hair ritual, back home I am 100% a Supercuts girl. I always go to the same store where everyone working knows me and my family so I know I’ll be taken care of. I’ve had my hair grown out past my waist and I’ve had it shaved down to a tight pixie and with all the levels and layers between, there have been plenty of times things could have gone wrong (and not just with me picking a bad length and insisting on doing it!). The only time I’ve ever had a problem (that I didn’t cause myself) was when a new girl was afraid to cut my hair, so really didn’t do what I wanted but it was easily fixed by getting someone else to do the cut—not hard done (but that girl didn’t last long in the store…). The problem with London is I don’t have that connection so it’s starting from scratch in a town where there seems to be a clear division: Pay a lot for satisfaction and customer care, or go cheap but you risk getting a butcher over a barber or you go to a school where you’ll wait 3 hours or longer (and you still can end up with a butcher). And then I found Tower Salon. I could go into the details of my experience (25 pounds and I got my hair wash—including a great head massage—cut, blow-dried and styled), but what I think what more important was finding a place where they take care of you. That’s what I think is the most important part of finding a salon/parlor/stylist: you have to find someone who cares as much about your hair as you do. They ask you questions about your hair (and lifestyle!) and really listen, even asking questions to clarify along the way. There’s the basic “so what are you looking for?” but then there’s the question of layers, slants and shapes, hair type, damage, ect. some of these are about what you want done but others are about what you may have already done to your hair (is it fried because you don’t protect it when styling, or do you have color damage, ect). Also, what do you do with it? Are you a wash and go person or do you tend to use products and work different styles? All of these are important for them if they are going to give you the best results. They don’t go straight to washing, wetting, brushing, or cutting your hair, but feel it out. Again, this may be the point what they ask you about coloring or damage or texture—just remember, they aren’t getting after you; just feeling out the situation so they know how best to proceed. On this trend, don’t lie about what you do to your hair! If you’ve damaged it in a DIY attempt, they should be told they’re dealing with that and not hair that is naturally dry—the way they handle these could be very different. They’ve listened to what you want, but they aren’t afraid to make suggestions. Yes, it’s your hair and you want a specific look, but a good stylist will tell you if there may be a problem (just because a cut works on a model/celebrity, doesn’t mean it will work on you!). When I had a pixie, my stylist and I discovered I have 5 distinct cowlicks, including one at the nape of my neck. We switched up the cut a little and changed how she was cutting those parts and it all worked out. But remember, just because it’s suggested, doesn’t mean you have to go with the recommendation—it’s still your hair. They check in during the cut. Unless they have a really strange method which continually changes the whole style at every turn, you can more or less, see what is going on as your hair is cut. This also means that you can probably tell if something is or is not turning out how you want before the end of your cut. If your stylist checks in with you at each stage you’re a lot more likely to get what you want and much more quickly than if you both wait until the end. But if your stylist isn’t checking in and something looks wrong, SPEAK UP? I’m in no way saying jump in and say something like “what are you doing to my hair?” or “that doesn’t look like what I asked for!” but asking a question (always politely!) like “is this going to get shorter when it dries?” can get a conversation going where you can point out parts that you don’t feel look quite right. The questions can prove that they didn’t understand and get you on the right track, or they may explain the method to their madness which will help you feel better during the process. A good stylist won’t be upset/offended if you ask them to change something. Of course this may be annoying especially if YOU weren’t specific enough in explaining what you wanted in the first place, but if you politely ask for something they can do (ie, they can’t make it longer but adding another layer or two or taking it up a bit more isn’t a problem!) shouldn’t send them into a tailspin. If you get flack for that, you should definitely take your business else ware. So besides being competent and having general good service, these are my 5 big checks to finding out if I’ll be sticking around for another hair cut or moving on. Lucky for me in this ungodly expensive town, I’ve found a place that meets all of these requirements, doesn’t break the bank (if you don’t need your hair cut too often!) and lets me feel pampered at the same time. Next week I’ll be taking about packing for Paris but until then, live well and let me know your biggest do and don’ts of the hair cutting/styling world!